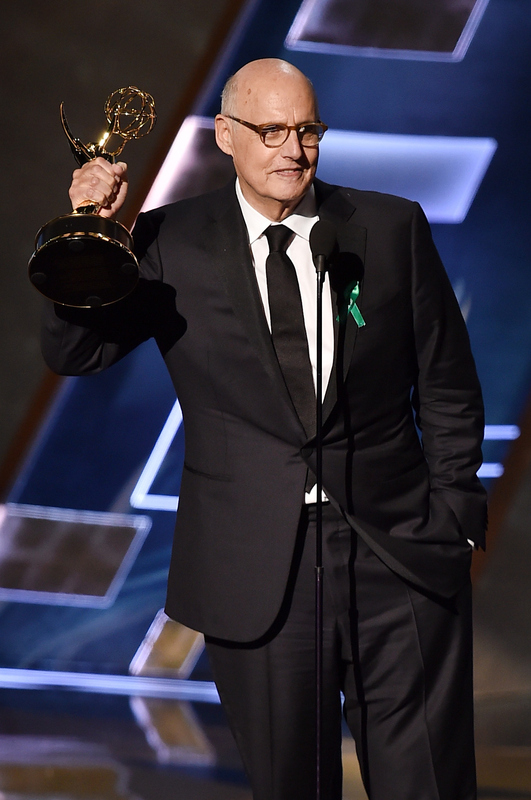 Jeffrey Tambor just had a huge moment at Sunday Night's Emmy Awards. Though many might not be surprised to see the actor take home a win for Outstanding Lead Actor in A Comedy Series for his role as Maura Pfefferman on Amazon's Transparent, the win feels just as good as all his fans thought it would. What's even better was the actor's all-too-important speech and dedication, during which Tambor honored the trans community. At first, he just gave a sweet speech that showed how grateful he was for his part on the show. "Thank you so much. I am so, so honored. I had a teacher who used to say when you act, you have to act as if your life depends on it, and now I have been given the opportunity to act because people's lives depend on it," he said. Tambor continued: "I'd like to thank Jill Soloway for giving me the privilege and responsibility of Maura Pfefferman from the Pacific Palisades. I would like to thank this gorgeous cast. Every time and everywhere you rest your eye, there's genius..."
Very true, especially considering that Transparent's creator, Jill Soloway, picked up an award at Sunday's show, as well. But then Tambor's speech got even better, when the actor said, "I am going to wrap up by saying, not to repeat myself, but to specifically repeat myself: I would like to dedicate my performance and this award to the transgender community. Thank you for your patience, thank you for your courage, thank you for your stories, thank your inspiration, thank you for letting us be part of the change. God bless you." This is Tambor's first Emmy win, but seventh nomination overall. He beat out an impressive list of fellow nominees for this year's award: William H. Macy, Louis C.K, Anthony Anderson, Matt LeBlanc, Don Cheadle, and Will Forte. Although all those actors are talented, Tambor taking home the prize is a major win for not only the Emmys and their recognition of diverse storytelling, but for our culture's support of the transgender community. While it would be ideal to see a transgender actor playing this role and gaining such accolades, Tambor acts as a great ally to the trans community. This dedication couldn't have come at a better time, and neither could Transparent. The show boasts a cast of impressive talent and has a significant story to share with the world. Let's hope this isn't the last bit of recognition it sees on Sunday's show, and that the Emmys continue to give actors such as Tambor — and shows such as Transparent — the stage more often. Thank you, Transparent, for being such a groundbreaking, thought-provoking show, and thank you to Jeffrey Tambor, for giving the transgender community a heartfelt and important shout-out. Your message is powerful, and it's being heard.